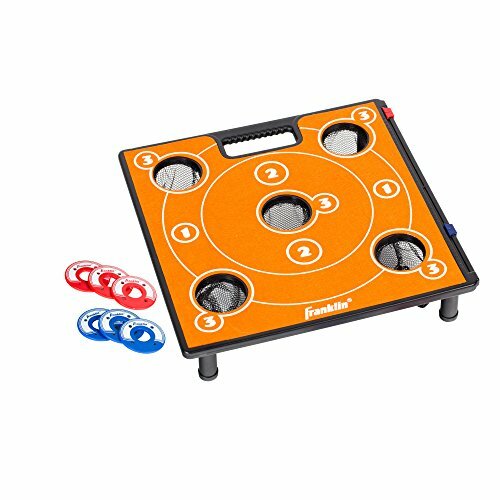 Create a friendly competition against family and friends with the Franklin Sports 5 Hole Washers Game. Much like horseshoes, washers is a challenging game that requires poise and precision. The goal of washers is to get the washer into the target hole for points. This game set features 1 molded 5 hole, felt surface washer target with 3 red and 3 blue washers. For hours of amusement, bring the 5 Hole Washer Game to your next BBQ. ROPODA Washer Toss Game Set-Outdoor Family Game-Perfect for Lawn,Backyard,Beach,Parties, Camping, Tailgating and more.